Quantum Hi-Tech Merchandising Private Limited, popularly known as QHMPL has been producing quality electronics since 1992. 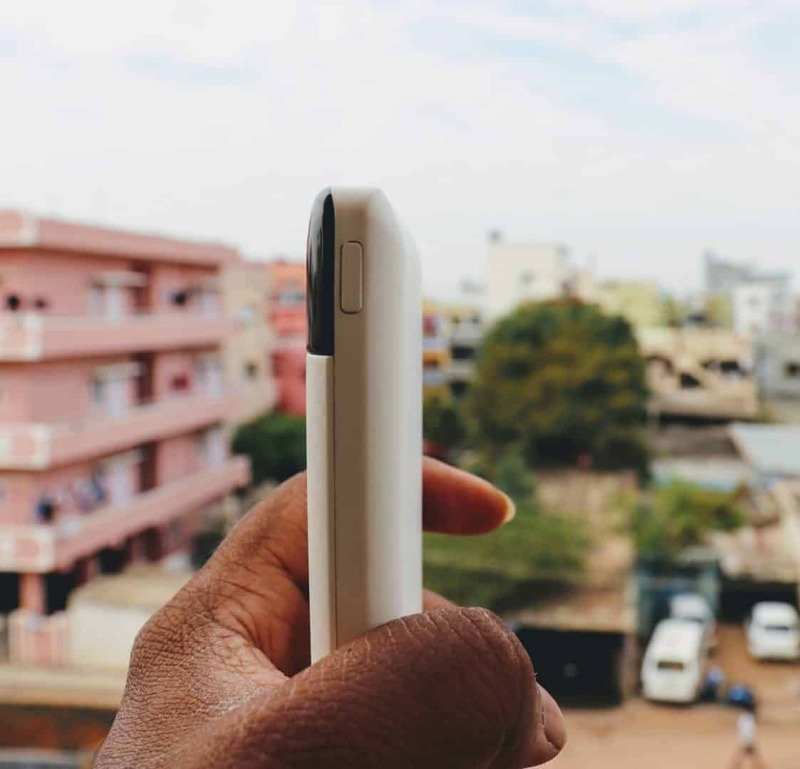 The company has recently launched a 10,000 mAh powerbank which is allegedly one of the slimmest powerbanks available in the Indian market now. I received it a few days back and followed the same testing which I used for Philips 13000 mAh Powerbank. 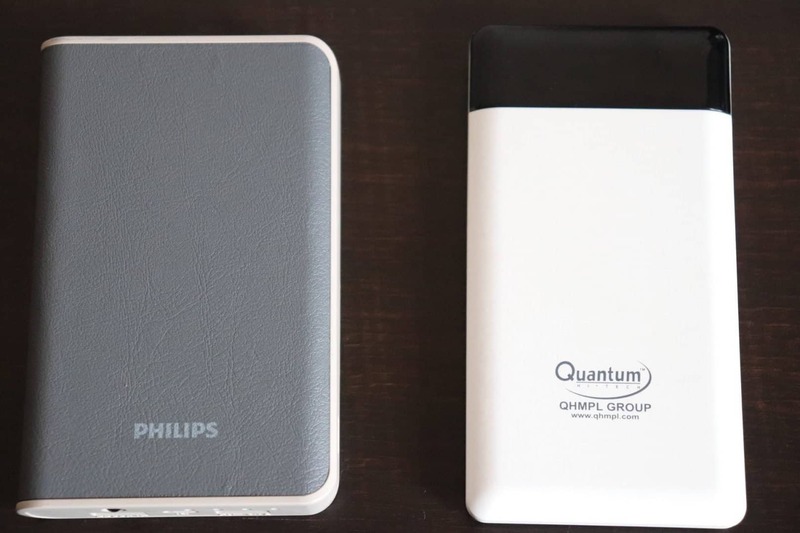 When we see both powerbanks side by side, the QHM 10KP 10000 mAh looks very slim and weighs less when compared to Philips 13000 mAh. It’s because the latter is a Li-Ion packed powerbank while the former is a Li-Po, and that’s why it’s very slim. 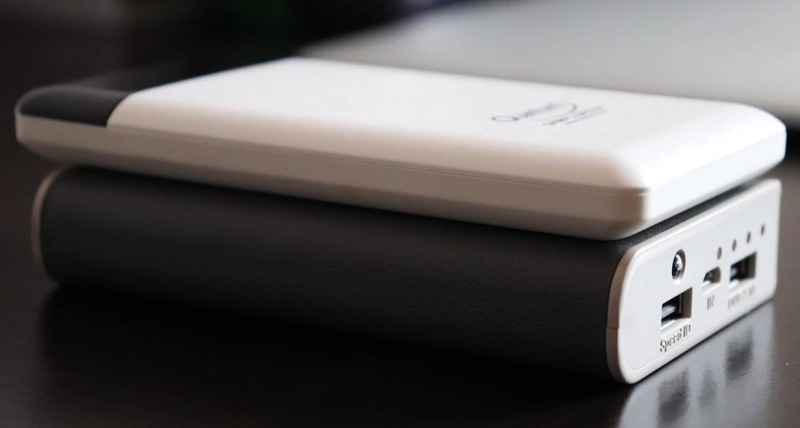 Considering all these differences between Li-Ion and Li-Po batteries, each of them have their own pros and cons, but to make devices slimmer, OEMs should use Li-Polymer batteries and that’s what QHMPL did for QHM 10KP 10000 mAh powerbank. That’s why the powerbank looks slim and weighs less. But what about the performance? To know that, let’s dive into the review. Before we take a look at the power bank’s performance, let’s have a look at the key specifications and features. 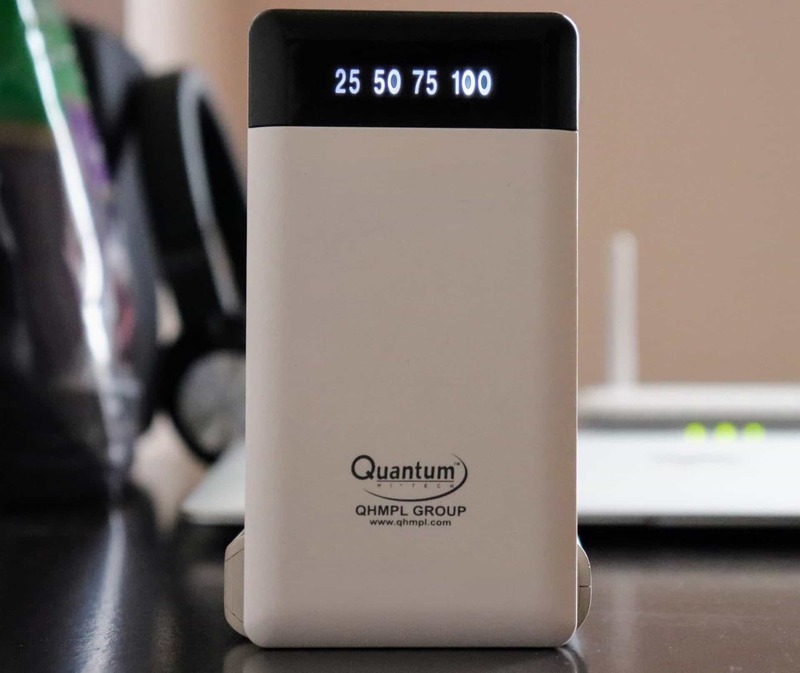 The design of Quantum QHM 10KP 10000 mAh is heavily inspired by Google’s Pixel 2 [white & black]. The only difference is the rear side of the phone’s design is the front-view of the powerbank. The curved black stripe at the top is actually an OLED screen which shows the battery percentage of the power bank. Just to the right, you can find the power-ON/OFF button. 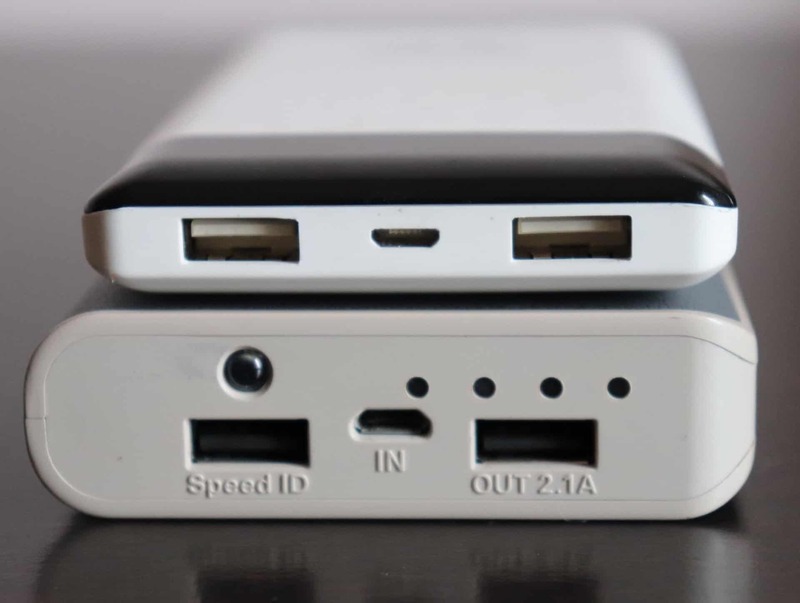 At the top, you can find 3 ports where the 2 are output ports each supporting 5V/2A whereas the other is the input port to fuel-up the powerbank. That’s exactly what you can find in the powerbank and nothing much. Now here comes the best part – performance. 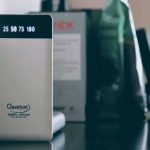 Just like the tests carried out to assess the Philips 13000 mAh powerbank, I followed the same for QHM 10KP 10000 mAh powerbank. Prerequisites: Before I started the test, I charged the powerbank for straight 8 hours [as mentioned in the manual and on the website]. I used Zenfone 3 [3,000 mAh], Redmi 4A and Lenovo K3 Note for testing. Also, the powerbank was taking around 6-7 hours for a complete charge. How much time does it take to charge a 3000 mAh battery? Initial Spike: Like in Philips Powerbank, I’ve not seen any initial spike! Beyond 50%: As said, it started taking more time for an increase in 1%. On an average, it took 2.5 – 3.5 minutes for every 1% increase. After a couple of tests, I found that to charge a 3,000 mAh battery, the powerbank took 3 hours 30 minutes which is comparatively lower than a normal Li-Ion powerbank. Now here comes the big question, what’s the discharge rate of powerbank? How’s the powerbank discharge rate? 100% – 75%: It took around 1 hour for the first drop. Overall, the powerbank lived for a total of 7 hours 50 minutes [average of 3 tests]. Well, the discharge rate would improve after a couple of charging cycles. Now, let me conclude it like this – For a price of Rs. 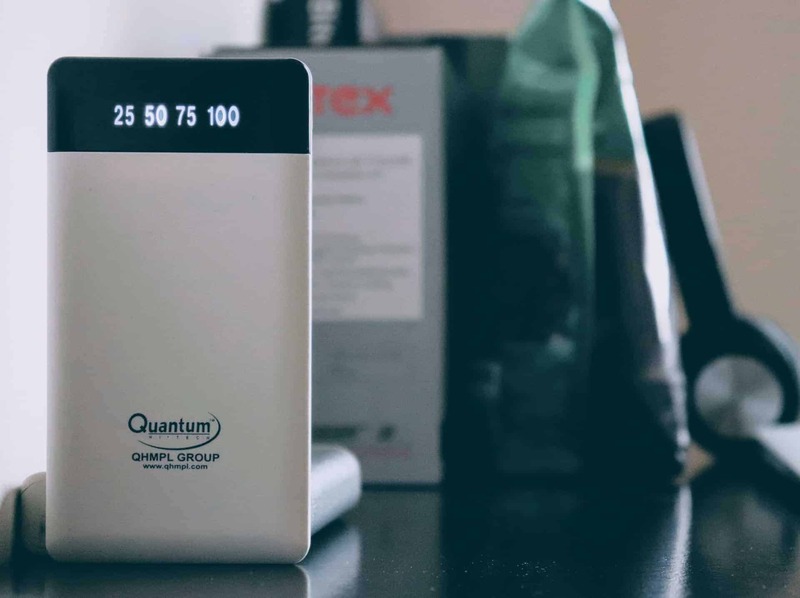 1,099 the Quantum QHM 10KP 10000 mAh, I’d say it’s a steal-deal. So, go ahead and purchase it right away. For a price of Rs. 1,099 the Quantum QHM 10KP 10,000mAh, I'd say it's a steal-deal. So, go ahead and purchase it right away. Previous articleMeet Neweex – The Most Versatile, Multi-functional Backpack You’ll Ever Need! Next articleElectric Vehicles: Is India Ready for Next Big Revolution in the Automobile Industry?